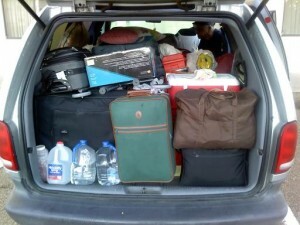 No "Out There" » Arizona or Bust! We didn’t manage to get out of Chicago until 11:15am Saturday morning Oct 10th. Usually Mom has us on the road by 6:30am! There was some discussion as to whether we were going to go ahead and leave or wait until Sunday to leave. After Mom spoke with Ruby and discovered they were only keeping her overnight, Mom determined we would continue on and she’d keep in touch with Ruby by phone. She, Dad and I made, I don’t know, 4-5 trips back and forth? 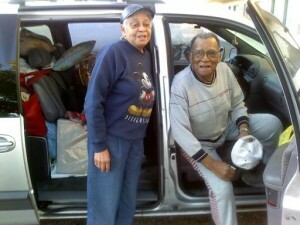 And then we were FINALLY packed and in the van!!! The fall scenery driving through Missouri was spectacular, green, brown, orange and golden yellow foliage, blue skies sprinkled with cotton-candy type clouds – nice crisp air – WONDERFUL! Even though we had put it on ice in the ice bucket, the left-over fruit smoothie Mom made Saturday morning before we left Chicago, exploded early Sunday AM in the motel room while we were sleeping. (We shared the room,) So she and I, Mom insisted, were washing down the walls, jackets , sweatshirts, Daddy’s hat and orthopedic stocking at 4am Sunday morning!!! I couldn’t stop laughing. Dad, who was still lying in the bed, was wise-cracking, he asked, “What was in that drink? Are you still gonna’ drink it? If it’s exploding, what’s it doing in your stomach?? ?” I was holding my sides laughing because I had heard the explosion and thought it was the ice, in the ice bucket, cracking and melting. Neither one of them heard a thing over Mom’s SNORING!!! LOL! When Dad finally did get out of bed, he pooted with every step on his way to the bathroom – OMG! Thank goodness I didn’t smell a thing. They both got back into bed and went back to sleep while I worked on this e-mail and the blog. Of course, once I lay down, they got up and began getting dressed. We ate a GREAT BIG Breakfast at Shoney’s next door and were still laughing about the fruit smoothie that blew up. We figure something had begun to ferment. When we stopped for gas later I looked for the SoBe Energy Drink I like to use for these trips, because unlike the other trips, this time I am doing ALL of the driving. In the past Dad has driven about 2 hours worth. The first year I assisted, ALL of us participated with the driving. With Dad having the knee replacement surgery the past two years, his participation has been limited. Mom announced, to no one in particular the morning we were leaving, “I’m not going to drive anymore.” Dad and I looked at each other and burst out laughing because Mom hasn’t done any of the driving for years!!! When she realized why we were laughing, she smiled and began laughing too. Pre- and Post THE FOG! 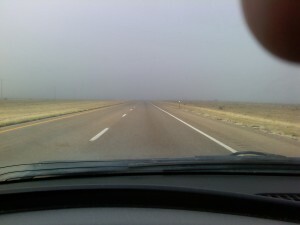 When we got to Amarillo, I decided to exit for a bathroom break – I had had enough of driving through the fog. While we waited for Dad, I called The Golden Dragon Restaurant in Tucumcari to find out what time they closed. That restaurant is the MAIN reason we stop in Tucumcari in the 1st place. Mom likes their Shrimp Egg Foo Young! They now close at 4pm on Sunday’s!!! It was 6pm. Oh well. 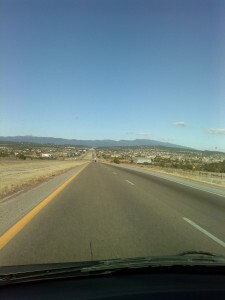 Back on the road and NO MORE FOG the entire drive to Tucumcari. LOA? If anything interesting happens on the road to Peoria, I’ll let you know on the No Out There Stopping The Blame Game talkshow on Wednesday. If I have time, I’ll tweet it too!